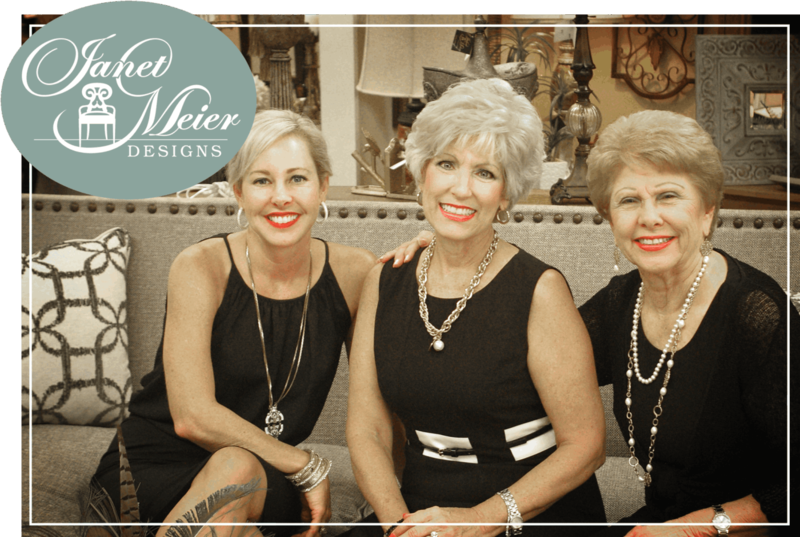 There's a story behind Janet Meier Designs. A story you don't hear very often. Read below to find out how unique we are. Many years ago, a very talented interior designer by the name of Linda Montgomery opened the doors of Montgomery Interiors in Shreveport, Louisiana. Her business grew successfully, fulfilling the decorating needs of Shreveport's finest homes. Then in 1988, she took on staff a young designer who showed great promise, Janet Meier. Linda recognized Janet's innate abilities to find the perfect furnishings in the perfect fabrics for the perfect rooms. Clients with the most descriminating tastes soon realized this young apprentice made their homes reflect the escence of who they were in a comfortable, yet exciting way. After working side by side with Janet for 22 years, Linda felt it was time she could confidently pass the baton on, literally swapping roles. Since 2010, Linda has made a first class assistant (and friend) to owner of the newly named Janet Meier Designs. Over the years, Janet Meier Designs has added a second full-time designer and one part-time designer, and an office/floor staff of three to keep the store running smoothly. Janet stays busy helping clients at whatever stage of the decorating process they are in, whether just drawing up floor plans for a new home, pulling together a just moved into home, or redecorating a well-loved space that needs a breath of new life. Call Janet Meier Designs today or come by the store. She would enjoy getting to know you, your personality, and what will make a house your home. It will become a reflection of your individuality.